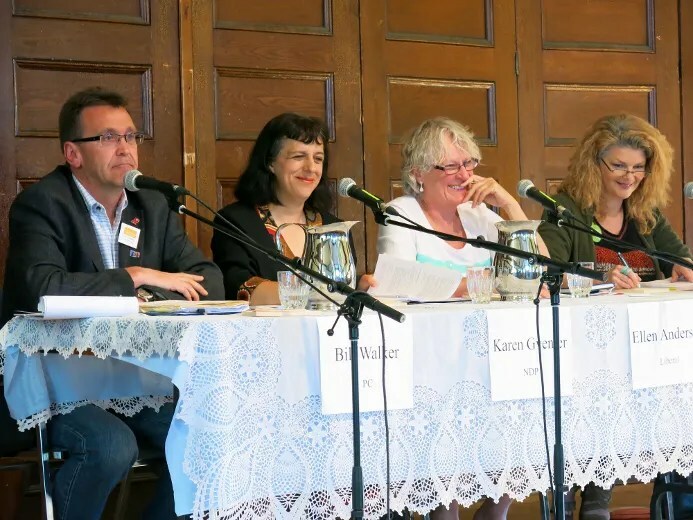 OWEN SOUND – The deficit-fighting Progressive Conservative MPP Bill Walker told a left-leaning social justice crowd at Friday night’s all-candidates meeting in Owen Sound that he’s a “compassionate” guy who thinks government has to say no to more social spending. But while the Liberal, New Democrat and Green candidates generally agreed with pleas for more social supports and often promised funding, most times Walker said he either couldn’t speak for the party or wished he could make financial promises but Ontario’s $11billion annual deficit must be slayed first. Walker received a polite but skeptical reception from many during the two-hour meeting. He told them he was 10 when his father died, leaving his mother to raise him. She worked hard and they were of modest means, he said. He’s been an active community member, having organized Terry Fox runs, ran the Heart and Stroke office, led hospital fundraising, he told them. He said he’s been “overwhelmed” since being elected and feels sad about need in areas including mental illness, kids with disabilities, seniors who can’t get home care or get into nursing homes, and has been touched by the needs of people with Alzheimer disease, which all need more money. “The well is dry folks. We’re spending $11 billion and they want to add $3.5 billion more this year to the budget,” he said of the Liberal minority government’s budget. Neither NDP or PC MPPs supported it, forcing an election which will take place June 12. But Ontario Premier Kathleen Wynne vowed she’ll reintroduce it if re-elected. Walker didn’t like the suggestion from a candidate and questioner that Conservative leader Tim Hudak was aiming to reprise the Mike Harris Conservative government’s years of cutting social services and public service unrest. He then observed Ontario saw high spending over the last eight years and hit record deficits, 800,000 people are out of work and it has the “highest levels” of poverty and unemployment and so “we need to change the way we’re going” to ensure needs can be met. Gventer said that’s how people are referred to in politics and so she refers as much to Hudak as she does Horwath, NDP leader Andrea Horwath. Organizers of the social justice-focused debate asked questions about each candidate’s party positions on and commitments to fund programs supporting victimized women (particularly aboriginal woman), affordable housing, and corporate tax cuts. The candidates received them in advance and came prepared. Liberal candidate Ellen Anderson got big applause for her responses when asked if their party would demand a federal inquiry into the 1,186 murdered and missing Aboriginal women over the past 30 years and what is her party’s strategy to address violence against Aboriginal women in Ontario. She agreed to demand an inquiry. “I find it amazing that this is actually a question that we have to ask. I would think that the federal government should be just wanting to do this,” she said. Anderson cited efforts federal Liberals are taking to pressure the Conservatives on that and related fronts. She also said she and her First Nations friends were talking recently about how ignorance destroys relationships. A number of questions came from the floor, about which the candidates had no time to prepare. Green Party candidate Jenny Parsons seized on a question from Ray Botten, an outspoken volunteer at the Victorious Living Centre in Owen Sound. The water was recently turned off to the church and soup kitchen there for unpaid bills, leaving Botten disillusioned and asking the candidates why he should bother to vote. Parsons was familiar with the story and recounted that someone had broken into the soup kitchen and cooked a pot of spaghetti days before the water was turned off. She likened the outsider Greens to that guy who broke into the soup kitchen. “I think you should vote Green Party because it’s like breaking into the kitchen and making spaghetti dinner,” she said, drawing laughs and applause. 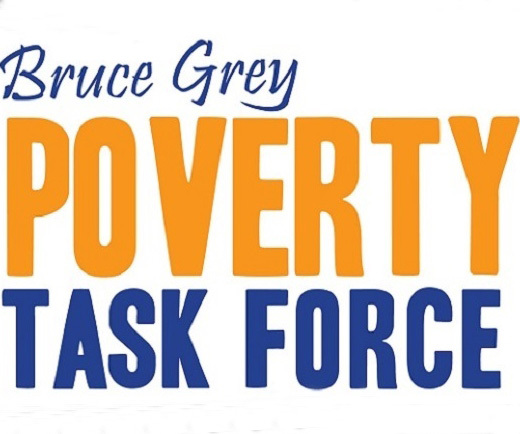 The event was organized by the Women’s Centre Grey and Bruce, HER Grey Bruce, M’Wikwedong Native Cultural Resource Centre and Peace & Justice Grey Bruce.